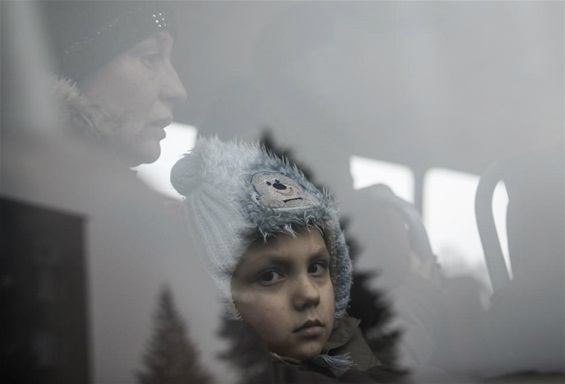 Real Faces/Lives in E. Europe Geo Political "Chess Game"
02/03/2015 Debaltseve, Ukraine: A boy looks through a bus window before the departure, as people flee due to the military conflict, in Debaltseve, Feb 3, 2015. (Reuters) NOTE: TCW has not commented on the Ukrainian Crisis until now. In brief, we believe that the CIA/NATO is most to blame for the bloodshed/civil war in the Ukraine. It seems a peaceful solution could have been attained, however that sane course of action conflicted with the greedy Western Globalist's (European Union/Washington D.C's) Business plan. Hence they fomented a bloody type overthrow of the lawfully elected Ukrainian government (in Feb 2014). You don't have to be a political "scientist" to know Putin was, and is going to protect his country's borders/interests. Putin's repeated lies denying Russia's military involvement in Eastern Ukraine, have severely diminished any credibility he may have had. "War is hell" ... so far more than 5,000 people have been killed and more than a million have been displaced due to this terrible conflict. Let's all say a Rosary for true order and justice to be established in the Ukraine.